The chief role of a business analyst is to act as an interface between the project manager and the user by gathering information, documenting processes and confirming final documents. 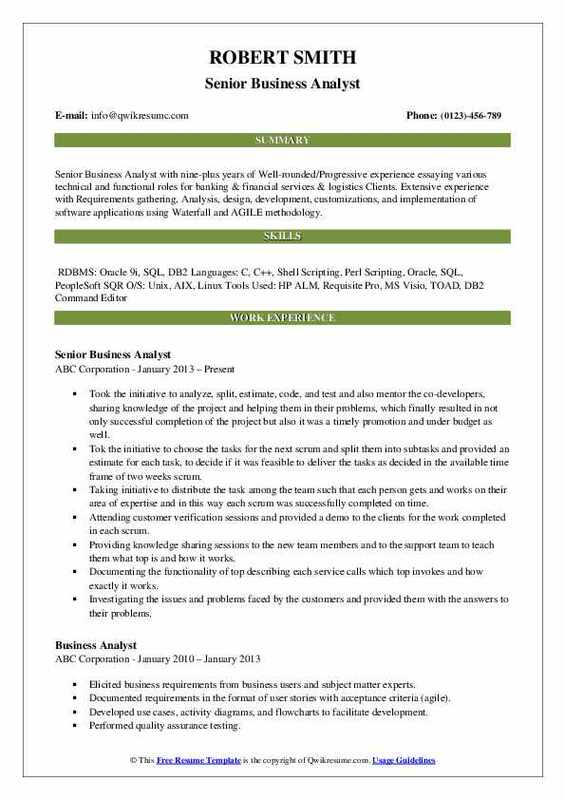 Key responsibilities highlighted in the Business Analyst Resume include – defining configuration specifications, performing quality assurance, defining reports and alerting requirements; maintaining system processes, performing requirement analysis, staying up to date with latest processes, evaluating business processes, developing and implementing solutions and monitoring deliverables. Requirements expected for this position include – experience in eliciting testing and requirements, proven experience in analyzing data, visualization tools and techniques; solid SQL queries writing skills, technical writing skills and basic knowledge of generating process documentation. A bachelor’s degree in the field of business is normally expected on the successful resumes. 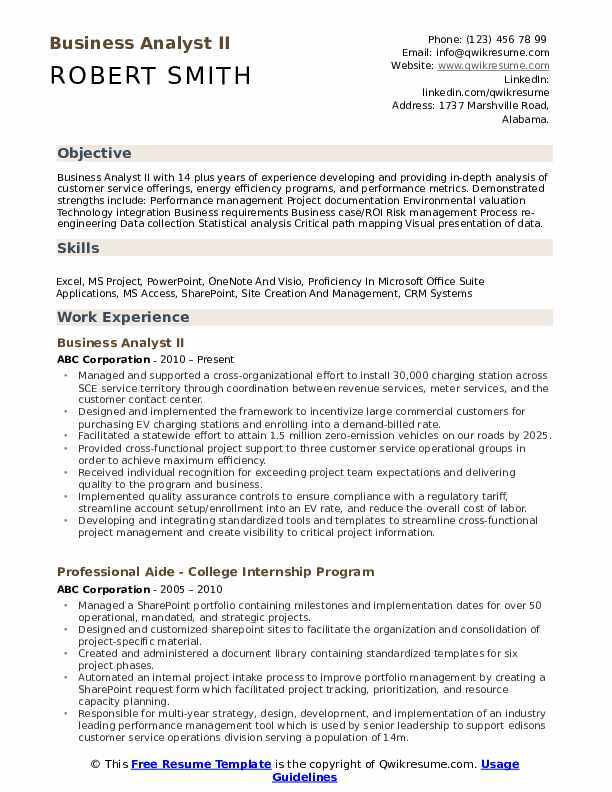 Summary : Business Analyst II with 14 plus years of experience developing and providing in-depth analysis of customer service offerings, energy efficiency programs, and performance metrics. Demonstrated strengths include: Performance management Project documentation Environmental valuation Technology integration Business requirements Business case/ROI Risk management Process re-engineering Data collection Statistical analysis Critical path mapping Visual presentation of data. Managed and supported a cross-organizational effort to install 30,000 charging station across SCE service territory through coordination between revenue services, meter services, and the customer contact center. Designed and implemented the framework to incentivize large commercial customers for purchasing EV charging stations and enrolling into a demand-billed rate. Facilitated a statewide effort to attain 1.5 million zero-emission vehicles on our roads by 2025. Provided cross-functional project support to three customer service operational groups in order to achieve maximum efficiency. Received individual recognition for exceeding project team expectations and delivering quality to the program and business. Implemented quality assurance controls to ensure compliance with a regulatory tariff, streamline account setup/enrollment into an EV rate, and reduce the overall cost of labor. Developing and integrating standardized tools and templates to streamline cross-functional project management and create visibility to critical project information. 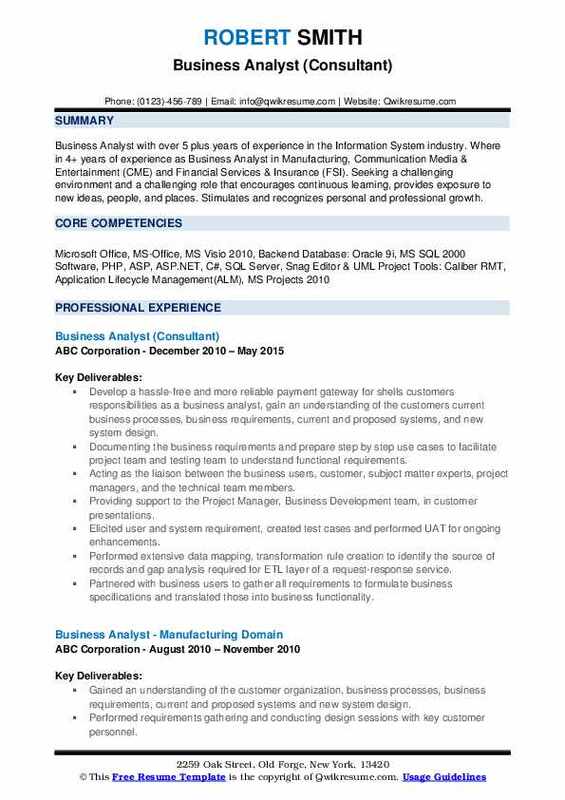 Headline : Business Analyst with over 5 plus years of experience in the Information System industry. 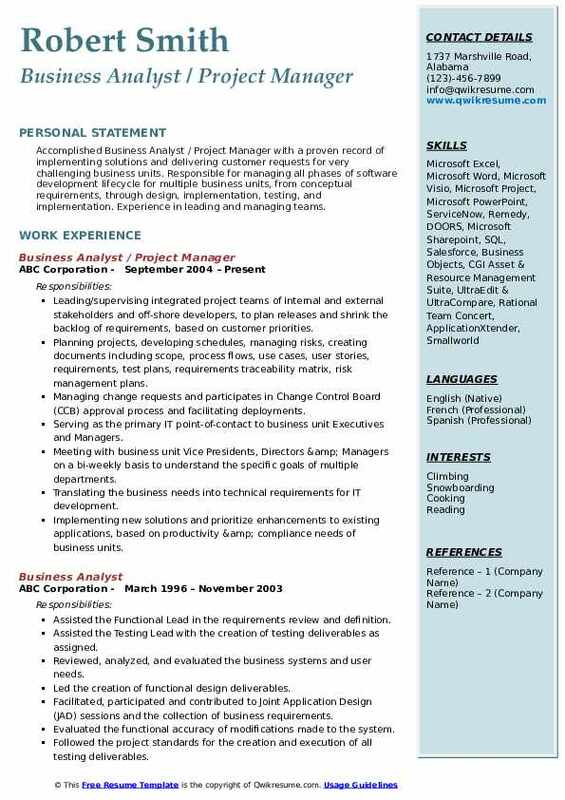 Where in 4+ years of experience as Business Analyst in Manufacturing, Communication Media & Entertainment (CME) and Financial Services & Insurance (FSI). Seeking a challenging environment and a challenging role that encourages continuous learning, provides exposure to new ideas, people, and places. Stimulates and recognizes personal and professional growth. Develop a hassle-free and more reliable payment gateway for shell's customers' responsibilities: as a business analyst, gain an understanding of the customer's current business processes, business requirements, current and proposed systems, and new system design. Documenting the business requirements and prepare step by step use cases to facilitate project team and testing team to understand functional requirements. Acting as the liaison between the business users, customer, subject matter experts, project managers, and the technical team members. Providing support to the Project Manager, Business Development team, in customer presentations. Elicited user and system requirement, created test cases and performed UAT for ongoing enhancements. Performed extensive data mapping, transformation rule creation to identify the source of records and gap analysis required for ETL layer of a request-response service. Partnered with business users to gather all requirements to formulate business specifications and translated those into business functionality. Summary : Senior Business Analyst with nine-plus years of Well-rounded/Progressive experience essaying various technical and functional roles for banking & financial services & logistics Clients. Extensive experience with Requirements gathering, Analysis, design, development, customizations, and implementation of software applications using Waterfall and AGILE methodology. Took the initiative to analyze, split, estimate, code, and test and also mentor the co-developers, sharing knowledge of the project and helping them in their problems, which finally resulted in not only successful completion of the project but also it was a timely promotion and under budget as well. Tok the initiative to choose the tasks for the next scrum and split them into subtasks and provided an estimate for each task, to decide if it was feasible to deliver the tasks as decided in the available time frame of two weeks scrum. Taking initiative to distribute the task among the team such that each person gets and works on their area of expertise and in this way each scrum was successfully completed on time. Attending customer verification sessions and provided a demo to the clients for the work completed in each scrum. Providing knowledge sharing sessions to the new team members and to the support team to teach them what top is and how it works. Documenting the functionality of top describing each service calls which top invokes and how exactly it works. Investigating the issues and problems faced by the customers and provided them with the answers to their problems. 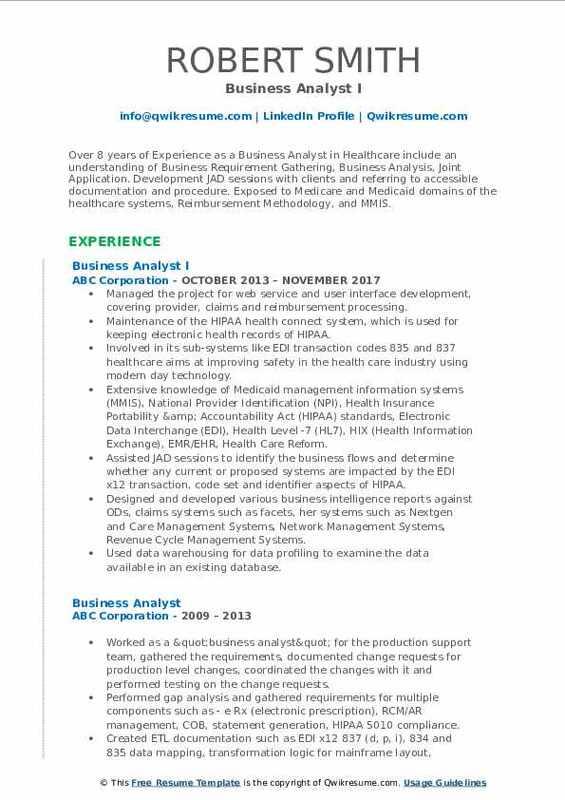 Summary : Over 8 years of Experience as a Business Analyst in Healthcare include an understanding of Business Requirement Gathering, Business Analysis, Joint Application. Development JAD sessions with clients and referring to accessible documentation and procedure. Exposed to Medicare and Medicaid domains of the healthcare systems, Reimbursement Methodology, and MMIS. Managed the project for web service and user interface development, covering provider, claims and reimbursement processing. Maintenance of the HIPAA health connect system, which is used for keeping electronic health records of HIPAA. Involved in its sub-systems like EDI transaction codes 835 and 837 healthcare aims at improving safety in the health care industry using modern day technology. Extensive knowledge of Medicaid management information systems (MMIS), National Provider Identification (NPI), Health Insurance Portability & Accountability Act (HIPAA) standards, Electronic Data Interchange (EDI), Health Level -7 (HL7), HIX (Health Information Exchange), EMR/EHR, Health Care Reform. Designed and developed various business intelligence reports against ODs, claims systems such as facets, her systems such as Nextgen and Care Management Systems, Network Management Systems, Revenue Cycle Management Systems. Used data warehousing for data profiling to examine the data available in an existing database. Developed plan for data feeds and data mappings for integration between various systems, including XML, to follow ICD 10 code set and ANSI x12 5010 formats. Developed a strategy for developing and implementing new EDI (hl7 and x12) interfaces and converting historical clinical and data. Summary : Accomplished Business Analyst / Project Manager with a proven record of implementing solutions and delivering customer requests for very challenging business units. Responsible for managing all phases of software development lifecycle for multiple business units, from conceptual requirements, through design, implementation, testing, and implementation. Experience in leading and managing teams. Leading/supervising integrated project teams of internal and external stakeholders and off-shore developers, to plan releases and shrink the backlog of requirements, based on customer priorities. Planning projects, developing schedules, managing risks, creating documents including scope, process flows, use cases, user stories, requirements, test plans, requirements traceability matrix, risk management plans. Managing change requests and participates in Change Control Board (CCB) approval process and facilitating deployments. Serving as the primary IT point-of-contact to business unit Executives and Managers. Meeting with business unit Vice Presidents, Directors & Managers on a bi-weekly basis to understand the specific goals of multiple departments. Translating the business needs into technical requirements for IT development. Implementing new solutions and prioritize enhancements to existing applications, based on productivity & compliance needs of business units. Coordinating with internal and external customers to elicit and document business requirements and use cases for business applications, thus ensuring that technology supports business processes. 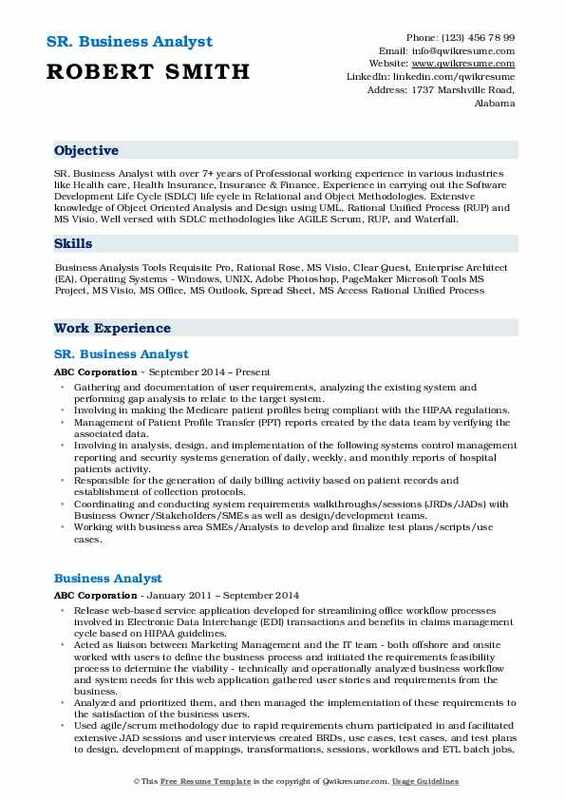 Summary : SR. Business Analyst with over 7+ years of Professional working experience in various industries like Health care, Health Insurance, Insurance & Finance. Experience in carrying out the Software Development Life Cycle (SDLC) life cycle in Relational and Object Methodologies. Extensive knowledge of Object Oriented Analysis and Design using UML, Rational Unified Process (RUP) and MS Visio. Well versed with SDLC methodologies like AGILE Scrum, RUP, and Waterfall. Gathering and documentation of user requirements, analyzing the existing system and performing gap analysis to relate to the target system. Involving in making the Medicare patient profiles being compliant with the HIPAA regulations. Management of Patient Profile Transfer (PPT) reports created by the data team by verifying the associated data. Involving in analysis, design, and implementation of the following systems: control management reporting and security systems: generation of daily, weekly, and monthly reports of hospital patients' activity. Responsible for the generation of daily billing activity based on patient records and establishment of collection protocols. Coordinating and conducting system requirements walkthroughs/sessions (JRDs/JADs) with Business Owner/Stakeholders/SMEs as well as design/development teams. Working with business area SMEs/Analysts to develop and finalize test plans/scripts/use cases. Worked with Medicare/Medicaid, denials, billing, claims, codes, mapping, and processing.